I remembered the days when I stayed by a busy morning street food market in Bangkok. There’s not only spicy and zesty food selling at the stalls but a western fusion bakery, steamed soft bread dipping in Thai custards, is popular and satisfying as well. 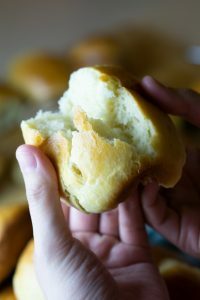 After I wander among French bakery, American buns, English muffins, Italian pizza crust and more on the world’s dough recipes, I always miss the day my aunt made me “ Sung Kha Ya” which is a creamy coconut-milk custard with “Kanom Pung,” a simple fluffy bread warmed in a steamer. Well, she was the best Thai dessert chef I’d ever known, but unfortunately, she didn’t know how to make a bread dough yet, so whenever she made a custard, I needed to go to a bakery shop and buy a row. And most Thai desserts like to blend with it. With a warm soft bread, I encourage you to make this for breakfast and start your day. However, today we’re going to make the custard, yay! Using a real natural flavor is worth your time, and it’s much easier when you have a powerful tool to help. I use Ninja Blenderto crush the leaves and squeeze out its aroma. 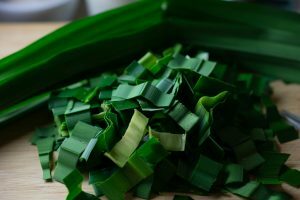 Use 6 Pandan leaves and only a half cup of water and crush it. Turn on and off and shake it till the leaves are finely smashed(turns dark green). Using a piece of cheesecloth to squeeze out the juice or extract. And do it 2-3 times to make sure there’s no residue. You can keep this in the freezer for a long time and use in many Thai desserts. 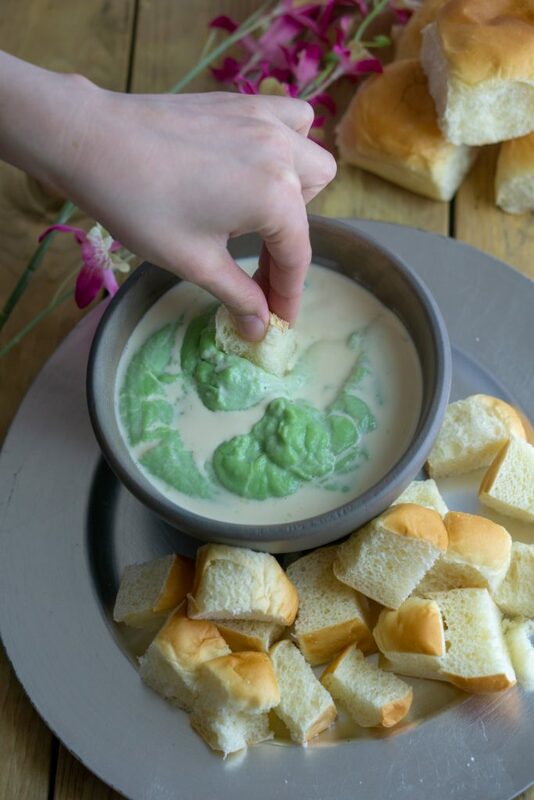 But, we’re going to use just 3 Tbsp in today’s sweet-treat recipe, Thai pandan custard dip. 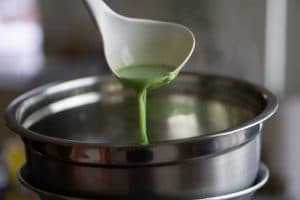 Now, you should have about 3/4 cup of pandan extract, wow! A warm snack dessert. This Asian fusion sweet-treat recipe has made from scratch. 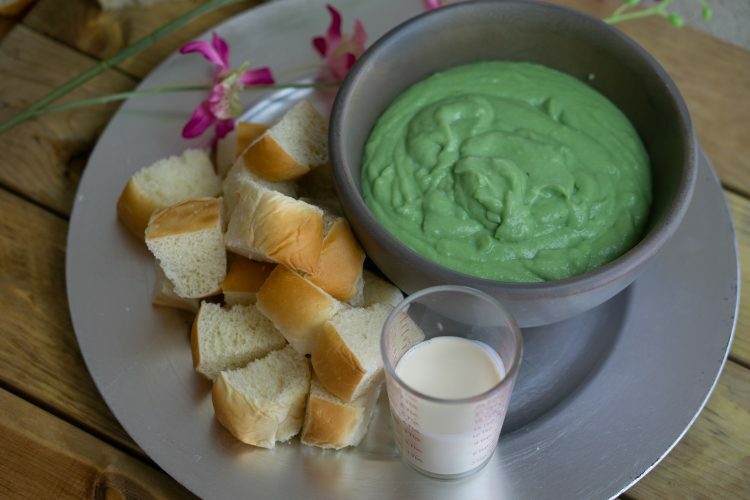 Warm up some soft bread and dip with the custard whenever stomach empty. Light and comfortable. 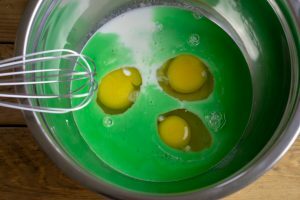 Pour milk, sugar, salt, eggs, pandan extract, cornstarch in an aluminum mixture bowl. Stir until well mixed. To enjoy, have a steamed warm bread cut in bite-size ready to dip. 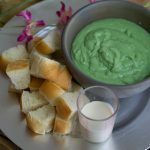 This dessert snack is a light sweet comfort food you can enjoy anytime between meals or after a meal but the best time is always the morning. 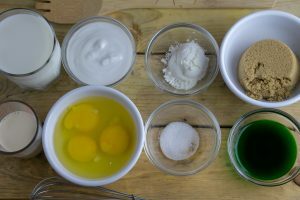 I come across that I can substitute the flavor to anything I wish such as coconut, vanilla, coffee, Thai tea, chocolate, and much more, as long as you have the flavors or syrups, and try to adjust the amount of sugar. Diversify your snack time with family and friends, yum! 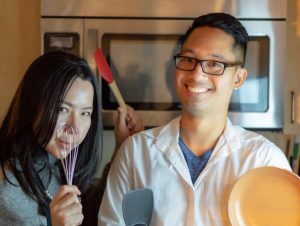 Oh, I’d like to see if you’ve already made one by tagging @unipankitchen on Instagram or comment with a link below!